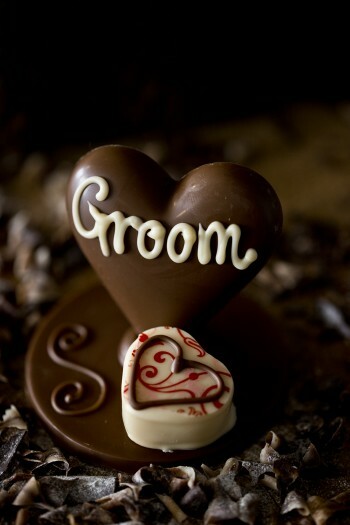 A chocolate heart hand piped with names sat on a chocolate disc with a strawberry champagne heart shaped truffle. A gorgeous gift for special guests at a party or wedding. These hearts are completely handmade from start to finish, so we are happy to customise your order to suit you with names, ribbon colours, etc – please contact us before you order to discuss your requirements. If you have any questions at all please email or call us before placing your order. Presented in a clear box with ribbon. Milk Chocolate (min 33% cocoa solids) White Chocolate (min 23% cocoa solids): Sugar, cocoa butter, whole milk powder, emulsifier: soya lecithin, vanillin. Strawberry champagne truffle filling: Buttermilk (milk), hydrogenated vegetable oil, vegetable oil, buttermilk powder (milk), modified maize starch, emulsifiers (sucrose esters of fatty acids, mono and diglycerides of fatty acids, soya lecithin), stabilisers (Guar gum, locust bean gum), Fruit paste (glucose syrup, invert sugar syrup, sorbitol syrup, carrot extract, beetroot concentrate, lemon juice concentrate, strawberries, raspberry and blueberry juice concentrate, modified starch, alcohol, acidifier citric acid, red beet extract, maltodextrin, ethyl alcohol, propylene glycol, natural flavouring substances, vegetable oil), glucose syrup and butter (milk), champagne concentrate.